The hydrograph for the Roaring Fork River at a gauging station in Emma shows there were six breaks of ice jams between Dec. 15 and Jan. 5. The two that captured the most attention occurred Jan. 4 — sending surges of water, ice blocks, logs and debris through the midvalley. A video of one event posted on the Basalt-based conservancy’s website has been viewed nearly 130,000 times. The hydrograph data showed that the water flow dipped with the temperatures in mid-December as the river iced up and then spiked after warm temperatures and pressure broke up the ice jam. 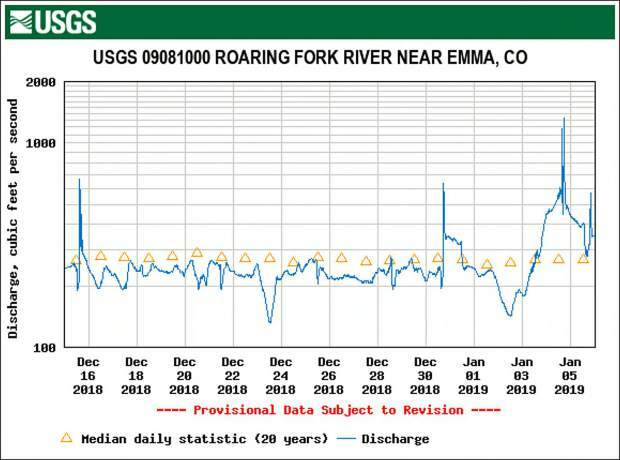 The water flow at Emma fell from 250 cubic feet per second to 200 cfs and suddenly surged to 700 cfs in a matter of hours. Those first three events went largely unnoticed, but shortly after the New Year, conservancy staff knew something was in the works when the water flow fell to 150 cfs. They issued a notice at noon on Jan. 4 that warming temperatures after a cold spell could lead to ice jams breaking. About two hours after the warning, the first of two massive breaks occurred, with the water flow reaching about 1,200 cfs. A second, even larger event followed at 4 p.m. with peak flow at about 1,350. In some places, huge pieces of ice were found more than 10 feet up the stream bank, Medved said. No flooding or injuries were reported. The latest ice jam break on Saturday night produced a mini-surge of about 600 cfs.